2. Freelance (creating websites for customers working remotely). Nowadays the word “freelance” means that designer and employer can cooperate regardless of their whereabouts. 3. Specific freelance (also concerns earning money on a remote basis but has its peculiarities). So, we won’t touch upon the first two groups as every web designer is definitely familiar with their specificities. But the third point deserves more detailed consideration so let’s get to the point. The first issue on my mind concerns the difference between second and third group as well as main peculiarities it is distinguished by. What’s so special about it? Probably, everything is rather simple. When you collaborate with the customer you receive payments for the work you’ve done directly as a designer, but the third group contains websites which have different methods of work accomplishment and payment system. As you’ve understood from the title the first resource representing the group is 99designs.com. So, 99designs, or how can a designer make money? The coolest thing about this resource implies the ability to choose the task you’d like to fulfill. The employer makes project requirements and designers accomplish it according to their choice after which the best work is rewarded. This is a short scheme but I’d like to describe every issue one after another. As on any other resource registration is the first thing to do but apart from your personal data you need to specify the purpose you pursue. For example, either you are a designer or you are a customer looking for an appropriate design. 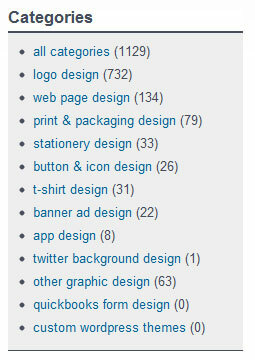 It is obvious that we should choose “I’m a designer” but not the variant shown in the picture. But I think you won’t experience any problems with it. After the registration you can actually start working but you need to choose the project first. How to do it properly? This is how the main project search window looks like. The picture with “blind” inscription means that all the works listed there are hidden from other designers. Then you will see the project title, customer nickname, time left for completion, the number of designers and the reward amount. 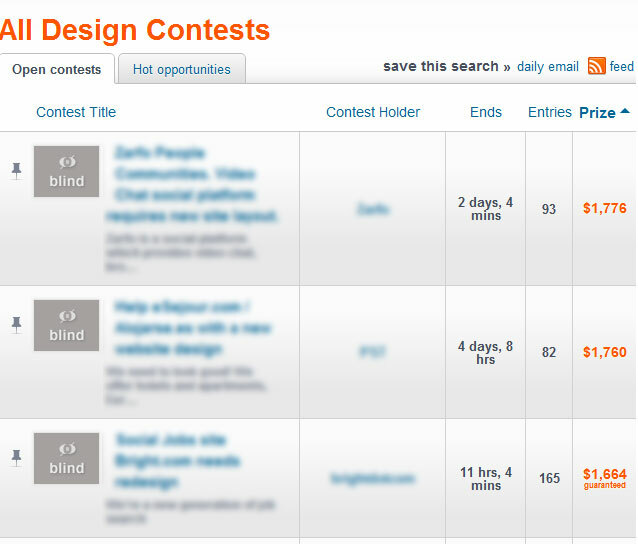 As you see, the third customer of the list has guaranteed that the winning designer will get the money. This is a very important aspect as, unfortunately, sometimes you can stumble upon fraud. Though, what does “fraud” mean actually? Some unpleasant accident happened to me lately. I created an application design of 5 or 6 pages, the customer said that he liked it and wanted me to make some changes. I’ve done the editing, showcased my work once again and the customer estimated it for 5 stars (every design can be estimated by the client). So, I waited till the project ended (there is a certain time for every project, usually a week), but my customer has disappeared. I messaged him but got no response. Finally, he didn’t get PSD files but he got the design which any beginner may copy if necessary. So you should be very attentive while accomplishing the projects with not guaranteed payment. It doesn’t mean that you should not take part in projects without a guarantee, just be careful. Well, let’s go on. I’d like to remark that this resource is developing in leaps and bounds so the changes are being introduced rather often. Thus, if the pictures I attached to my article will differ, don’t worry – it means that site owners just modify its design. But the main idea of 99designs won’t change anyway. So, if you choose this or that project the first thing you must do is to read “design brief” section, i.e. project requirements. Done with reading? Done with design? It’s high time to showcase your work. The page with “design brief” has a “submit design button” in its lower part (though other pages also contain it). When you click this button a page for uploading your design opens. Remember that you attach not PSD files but only a preview of your work. You can also leave a comment for your customer on this page. After it you must agree with terms and conditions of 99designs, confirm that assignable design is your work and click “submit my entry”. Then you wait till your work is estimated (or not) by the customer. One of the benefits this method of earning money for designers implies high rewards (for example, you can get up to $400 for a t-shirt design, but regularly it is $100-150; or $1000 for 2 web pages design). As for the disadvantages – you can create 10 different design variants spending 3-4 days on them, but the customer may choose someone else’s design so you won’t get anything for your work. In general, I think that 99designs is a cool resource for your skills development and is really worth trying. Sometimes I take part in some projects offered here. It is not always a successful try but there is a certain triumph of mine. By the way, after you are chosen as a winner (to be more precise, your design) you are redirected to the “Design Handover” page where you “sign” a so called Transfer Copyright and provide PSD source files. Moreover, you can chat with your customer on this page. This is how it is. Besides, another benefit of 99designs implies a variety of areas you can demonstrate your skills in: from t-shirts and websites design to mobile devices applications development. I guess, I told you everything I know about this wonderful resource. If you have some questions you can ask them in the comments area and I will answer you with pleasure!